It has been an awesome summer and it seems to have flown by in an instant. Kids will begin going back to school soon as autumn rolls in, but with the autumn also comes the next Brickworld Fort Wayne event, scheduled for October 11 & 12 at the Grand Wayne Center in downtown Fort Wayne. That’s only two months away! 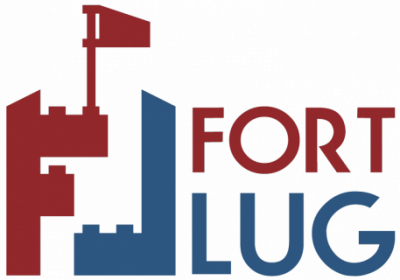 After a year of getting to know each other and working semi-publicly with a few local organizations, FortLUG is excited to make their debut at this premier LEGO fan expo. The group is nearing the final stage of planning for the combined display. A general layout has been determined and the details and dimensions are being finalized by participating members. The remaining issues with the layout will be the main topic of discussion at the meeting next Wednesday, August 13, at 6:30PM at the Little Turtle branch of the ACPL. There will also be advertisment postcards given to members that can then be handed out to friends, family, and acquaintances. All participating members should make it a priority to be at this meeting. Other members and interested parties are still welcome to attend, though at this point, inclusion in the group display will be very limited. Tickets for Brickworld Fort Wayne 2014 can be purchased online or at the door on the days of the expo. Door tickets, however, are cash only and slightly more expensive. For more information on Brickworld or to purchase tickets, please visit the Brickworld website from the URL below.